Yep, in my RPG demo as well. If you use Stella's Fixed Debug Colors mode, activated by Developer Key ALT-COMMA (linux, windows) or COMMAND-COMMA (Mac), you can see how the screens are generated. 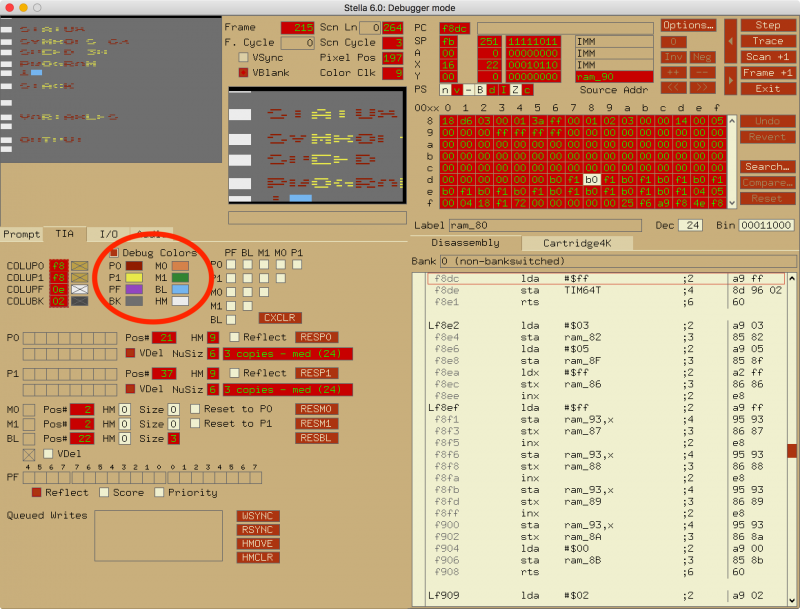 The debug colors are visible on the debugger's TIA tab. Hit ` to enter the debugger. I have coded the statusbar and messagebar below the map, and am happy with how it is looking so far. Time to actually add some gameplay! How are you imagining the game mechanics? Without a keyboard, interacting with the game could devolve into hunting through menus--or is that what you're going for? I could see using a joystick in one port, keypad in the other. Have an overlay for the keypad, be sure to do the overlay for all 3 styles - the others are Kid's Controller and Video Touch Pad. I've posted an example of reading the keypad on my site. One of these days Dragon Defense Squad may see the light. You could. The keypad would definitely be useful if magic or a large inventory are essential components. That would be a solid solution. On the other hand, I worry that adding another controller encourages unnecessary complexity. Sometimes, solutions looking for problems are seductive and we add complexities for the sake of complexity. I found Garriot's design decisions to be unnecessarily complex. For instance, when I stand on a castle, it's obvious I would enter. Having to hunt the "k" key to "klimb" ladders in a dungeon seemed unnecessary; I obviously want to klimb or decend. Yes, you could have a ladder that reached across multiple levels, but was it worth the complexity? I think Garriot saw the keyboard had lots of keys, so Garriot believed he must have something for each key to do. Versus imagining what he wanted to happen--and coming up with an easy way for users to interact with the game world. I've considered a joystick / keyboard combo, too, but I'm going to see how well I can do an interface with just the joystick first. Since I'm not actually doing an Ultima port, I can make design decisions that go with a streamlined interface. If no one has mentioned it yet, it didn't work on my Harmony. I got a message that it was an unsupported file type. I was trying to play on a 7800. But I did boot it in Stella. It's been a while, but this is the Ultima 3 map? There were a few Ultima style RPGs back in the day that used single button joystick interface. Legacy of the Ancients comes to mind. I'd say just pushing toward the enemy should be enough to attack. Touching a town, stairs, or ladder should be enough to enter/climb. Pressing the button can bring up a status screen or menu. Yes, this is a 64K ROM, so you would need a Harmony Encore or an UnoCart to see it on real hardware. Yes, I am using the Ultima 3 map for the initial phase of development, which is handy for doing side by side comparisons with the actual game. Eventually it will be replaced with my own maps and story. Status and message lines have been added. Castle may now be entered/exited (find the two secret areas!). Lava is colored correctly by changing the accent color as appropriate on overworld map (check the dungeon entrance south then east of the starting square). Wind is implemented, which affects sailing. Food now decrements, but reaching zero has no effect. Note that this is still just a map demo, so no gameplay/combat elements have been added yet, and talking to NPCs has still not been implemented. I wasn't intending to upload another version so soon, but I've completed and tested a new line-of-sight algorithm that seems to look better, and feels less "claustrophobic" when you are near walls. I don't "think" it reveals anything that it shouldn't, but please post any screenshots that show otherwise! The progress on this is incredible and the line of sight is a lot better now. 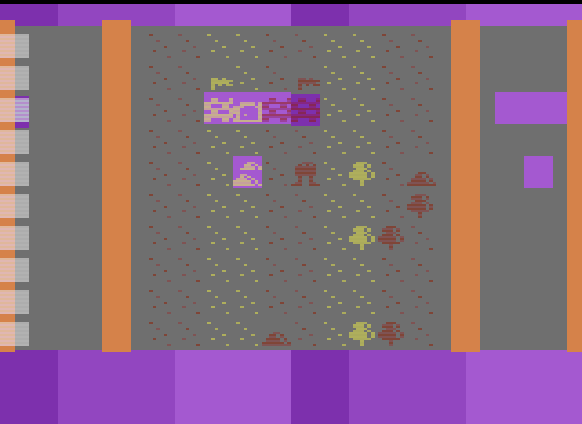 The framework you have already will make for such an immersive Atari 2600 RPG. How much detail are you planning to put into the game? Multiple people in the party? Conversations? Separate combat screen? At this point I'm sure the only limitation will be the size of the ROM you'll be able to create. Also, we'll be demoing your WIP on ZeroPage Homebrew on April 3, 2019, our first show back from our hiatus! ROM size is a consideration, of course, if I'm going to stick to 64K. The data alone from the world, city, castle and dungeon maps from e.g. Ultima 3 would nearly fill 64K all on their own. 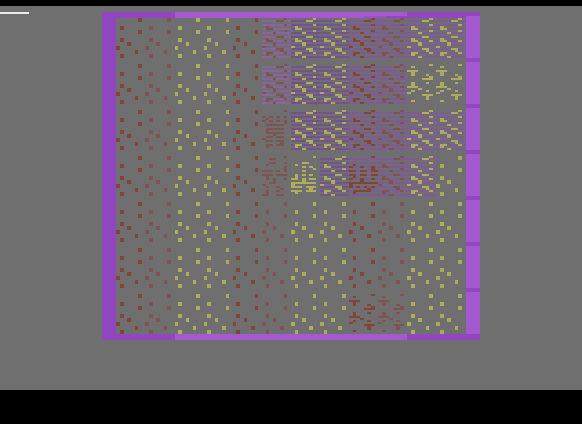 A city map in U3 is 64x64, which is an entire bank of data all on its own. The castle map I made for my demo is 40x28, and I'd be able to fit 3 such maps plus supporting code in one bank, I think. Anyway, I'm going to see how much I can fit into 64K, and I'll explore my options for a bigger ROM if it seems like I can't make the game I want to with that size limitation. Anyway, RAM and controls are also a consideration. I'm not doing a full party a la Ultima 3, but you will have a companion who will be with you from the start, and will fight by your side. I do plan on implementing separate combat screens with turn-based combat. Being able to converse with people is an important part of a game like this, and each NPC other than merchants and guards will have a name and something unique to say. Vital clues to the game can be found by talking to the right people. I'll try to make it to the livestream on the 3rd. I'm not sure how feasible this will be but you could divide up the world onto separate carts if you hit a wall with the ROM size and you'd be able to use the AtariVox to carry over the player data from cart to cart. I think Ultima IV had four disks for the game so it would be a similar idea to that. Of course this presents its own problems in the fact that not everyone has an AtariVox and I'm not sure where the ROM size vs. cost of carts crosses over. Well, an alternative to an AtariVOX or SaveKey for game saving would be generating a save game code, but this would be long and tedious. It does make me wonder if anyone has tried to make a single Atari game span multiple carts before, though. So, I finally tried my WIP version on real hardware with a CRT, and I wasn't thrilled with the results. I have since darkened the water color so that it contrasts better with the tile color. The reason this kernel has blank lines every other line is because I'm combining a 96-pixel routine with an asymmetric playfield to provide the accent color for water, lava, etc. If I didn't use the playfield and have the accent color, I could draw on every line, and use the "flickerblinds" technique to make the flicker less noticeable at the cost of a completely monochrome map. I love having the accent color and having the ability to make different cities look different from one another by changing this color. I am questioning now if the color is worth the sacrifice of more solid-looking tiles, however. Maybe I should make an experimental version that does monochrome with flickerblinds along the lines of RoboMechanick so that I can get input as to which looks/works better? Anyway, for now, here is a version with a darker water color for more contrast. Is there anyone who has tried a previous version that could compare it to this version? Also in this version, I changed the accent color inside the castle to a royal purple to give a demonstration of how different areas could get a slightly different look by changing the accent color. very cool so far. Probably a dumb question , but why not make the background a color other than black . Maybe depending on the environment ? In part it's to mimic the look of the classic Ultimas, but more importantly, the background would be per line, whereas a single line could contain a variety of terrain types. You could go with a grid password system (pioneered by Megaman 2 and Castlevania 3). I've released a new demo on the first post. There are more internal changes than visible ones, including lots of code cleanup, and better map support. The differences can be seen walking around the outside of the castle - it now fills in a default tile beyond the edges of the map. 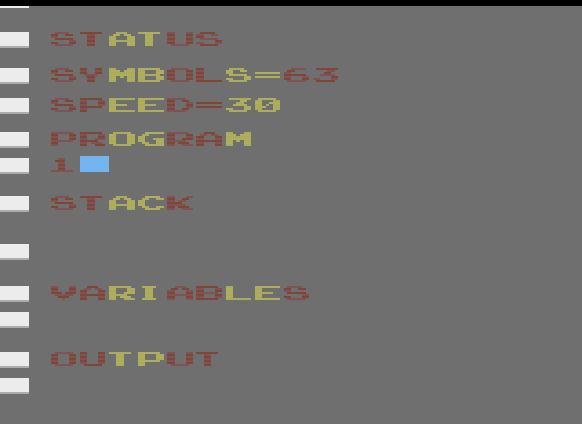 Note that James of ZPH has reported crashes on his system, but I haven't been able to replicate these on the two systems I have tried (an Atari Jr and a 7800, both using the Unocart). Please let me know if anyone else can reproduce any crashes on real hardware. This looks and feels awesome, definitely conjures up my Ultima memories Would it be possible to switch to a true flickerblinds kernel for stats and messages? I actually find that I like the "stripes" look of the map graphics, but it looks odd to me on the text. Edited by DirtyHairy, Mon Apr 1, 2019 4:02 PM. Thanks! The map and the text have blank lines for different reasons. The map does so because of the extra time needed for the async playfield, and the text needs it because it is doing an ORA for the left and right characters on the fly for each line that fit into each player graphic register. I could build it in RAM outside of the kernel each frame, but this would take 60 bytes of RAM. Oh, and a shout-out to RevEng, who helped me with the text kernel design, originally slated for a batari Basic add-on. It's too bad the text kernel never made it to bB. Very soon the AA store will have SaveKey's back in stock and plenty of them. The SaveKey could be a great way to save with your game. Maybe there can be a deluxe boxed edition that includes a SaveKey and a cloth map.